When water invades your home or business due to a storm, flood, broken pipe, or other accident, Emergency Restoration has the water removal, drying capability, and water damage clean up equipment to prevent greater loss. Our restoration services are not limited to restoring your buildings structure, we also specialize in content restoration. Our technicians are experienced in restoring appliances, electronics, furniture and many other items after water or flood damage. In most cases if the water damage is due to a sudden and accidental cause your home owners insurance policy will cover the water removal and restoration. 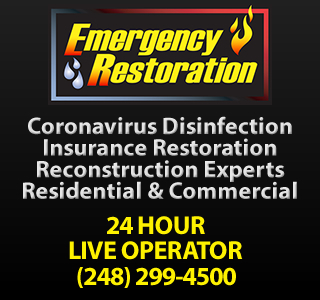 Emergency Restorations technicians use the latest technology and methods to remove the water and moisture from your home or business. Our truck-mounted water removal equipment removes all excess water from your carpet, padding and hard floor surfaces. When water extraction is finished we can begin the drying process. Our employees and managers attend the latest water mitigation training and certification courses. Our Vortex Drying System is the most effective and least intrusive method of drying by today's standards. Key in the drying process, we chart moisture levels in the air to ensure proper placement of dehumidifiers and air movers. Moisture levels in all porous surfaces are also measured. This record of the drying process tells us when satisfactory moisture levels are achieved. Emergency Restoration specializes in water damage restoration and water extraction from many types of disasters including flood, storm damage, broken pipes, and other accidents.